In light of rising sea levels and flooding events threatening metropoles around the world, this proposal investigates a maritime urbanism where the built fabric of the city shifts from traditional solid ground to a floating existence in harmony with the ocean. ‘Vers la mer’ – ‘towards the sea’ utilizes the potential of the Queens riverfront and Anable basin for such a transition from solid ground to the sea. 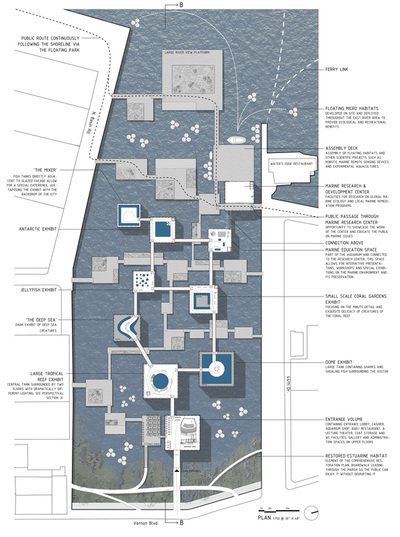 Orthogonal volumes based on the existing city fabric are coming loose and float, anchored in the enlarged Anable basin and are surrounded by a buoyant water garden in which the public can enjoy and experience the movement of life on the water. 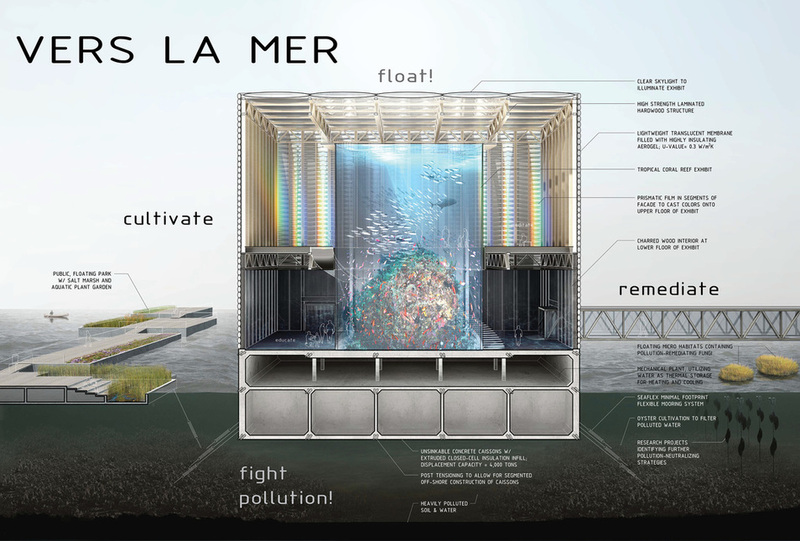 To address the pollution originating from the site’s industrial heritage, strategies for ecological remediation are developed, implemented and showcased publicly to raise awareness of the human impact on both local and global maritime ecosystems. The site is transformed into a waterscape with an estuarine shoreline and a network of floating platforms creating a public water garden. Integrated planters allow for salt marsh vegetation to be cultivated in a variety of relationships to the river – from the permanently submerged to the tidal – providing rich habitats for the local wildlife. The visitors of this garden can immerse themselves in the movement of the coastal waters and contemplate the beauty of its local flora and fauna. A series of connected volumes organizes the aquarium exhibits into different themes with distinct spatial and phenomenological qualities. Through a number of figure-ground alterations in plan the visitors find themselves sometimes encircling a large tank, sometimes totally surrounded by water, or channeled through a narrow space to focus on the minute details of ocean life. Carefully choreographed transitions between light and dark accompany this ‘promenade architecturale’ throughout the aquarium. Built on unsinkable concrete caissons with insulation infill, lightweight engineered hardwood structure and highly insulated, translucent membrane façade, these vessels manifest themselves as glowing lanterns in the nighttime cityscape. Restrained by a flexible anchoring system that adjusts with the tides, the volumes sway gently in the waves and prepare the visitors for a possible future life on the oceans. The site is marked as a CRP (Comprehensive Restoration Plan) by the Harbor Estuary Program. In this spirit, the proposal is dedicated to remediating the local ecology, interweaving estuarine habitats with the aquarium and public park programs, allowing public access for both enjoyment and educational benefit. Proven as well as experimental strategies, such as the cultivation of oyster beds for water filtration or fungi to break down hydrocarbons, will be implemented to remediate the pollution on the site. An entire building and workshop platform will be dedicated to global marine research and experimentation with the local interface of marine and urban habitats and their ecological and economical stewardship. This research center is located such that it allows for the interaction with the public both via ‘shop windows’ along the floating garden path and special workshop/ presentation spaces in the aquarium – an educational destination in its own right. Dominik is from Zürich, Switzerland and received his Architecture Diploma from ETH Zürich in 2007. He joined Steven Holl Architects in New York that same year. Currently, he is project and design architect for the Maggie's Cancer Care Centre at St. Barts in London and project architect for the Institute for Contemporary Art, VCU in Richmond, VA. Previous project architect positions with Steven Holl include the Glasgow School of Art Reid building in Scotland, UK. Dominik is interested in the visionary aspect of architecture and its potential to provide leadership for an abundant and just future. He loves nature and enjoys hiking in the mountains and swimming in the sea.